Asian American LEAD Updates! : The Intern Experience at AALEAD! Hey, my name is Fetsum and I have been interning with AALEAD for about 2 months now. I am an Ethiopian that was born in Kenya but grew up in Michigan. After two years at Western Michigan University I went abroad to Indonesia for a year to do volunteer work and fell in love with the country. I am currently a senior at Eastern Mennonite University, which is in Harrisonburg, VA, and I am studying International Development with a focus in justice, peace, and conflict. As a requirement for my major I have to do a semester internship in DC and my first choice was AALEAD of course. As an intern with AALEAD I have two supervisors, Rick and Danny. With Rick I have been doing a lot of stuff for the upcoming Annual Dinner, which has been keeping everyone busy. The other part of my internship I have been working at the after-school programs at Thomson and Bancroft, which has been awesome! On Mondays and Tuesdays we have three other interns that come to Thomson. We each have our own group of kids that we tutor and plan activities with. For my group we are in the process of making super heroes and villains out of anything that is reusable. 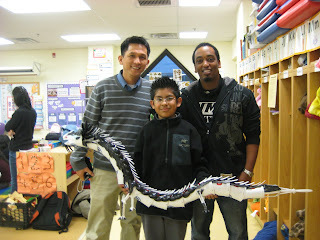 One of the guys in my group, Brandom, decided to take things on a whole different level when he and his father constructed the Dragon out of plastic cups and random plastic silverware. It’s pretty much the coolest thing I’ve ever seen. My time here at AALEAD has been great and I am certain that the rest of my time here will be just as good!